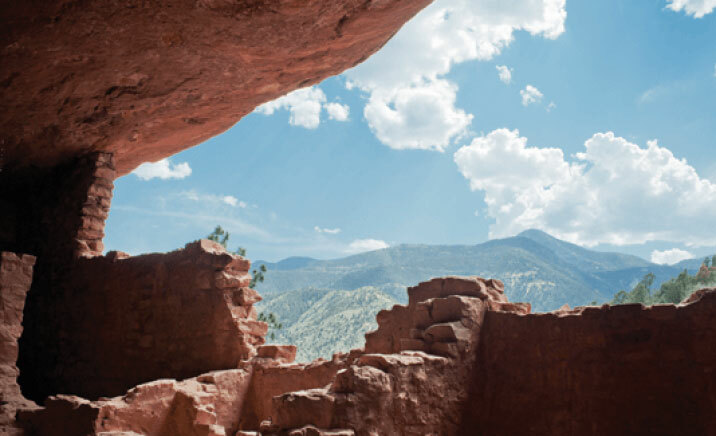 Modern scientists are not certain why the Ancient Ones left their cliff dwellings and stone pueblos, though most think they were either starved out or forced out. Some early archaeologists thought that the Anasazi disappeared without explanation, abandoning magnificent stone structures like the Cliff House cliff dwelling and a half-million gallon reservoir at Mesa Verde National Monument in Colorado, a five-story pueblo “apartment house” of 800 rooms at Chaco Cultural National Historic Park in New Mexico, and a huge sunken kiva with a 95-ton roof supported by four wooden posts at Aztec Ruins National Monument, New Mexico. Many clans of present-day Indian tribes trace their ancestry to the Anasazi. They say, “We are still here!” There is strong scientific evidence to confirm that the Ancient Ones didn’t mysteriously disappear, but evacuated major cultural centers like Chaco, Mesa Verde and Kayenta over perhaps a hundred years, and joined what are now Hopi and Zuni communities in Arizona and New Mexico and Pueblo villages along the Río Grande. Modern scientists are not certain why the Ancient Ones left their cliff dwellings and stone pueblos, though most think they were either starved out or forced out. The Anasazi left little writing except for the symbolic pictographs and petroglyphs on rock walls. However, a severe drought from about A.D. 1275 to 1300 is probably a major factor in their departure. There is also evidence that a marauding enemy may have forced them to flee.